If you look at my Exterior Pinterest board, one thing becomes obvious: I love a classic black and white house. 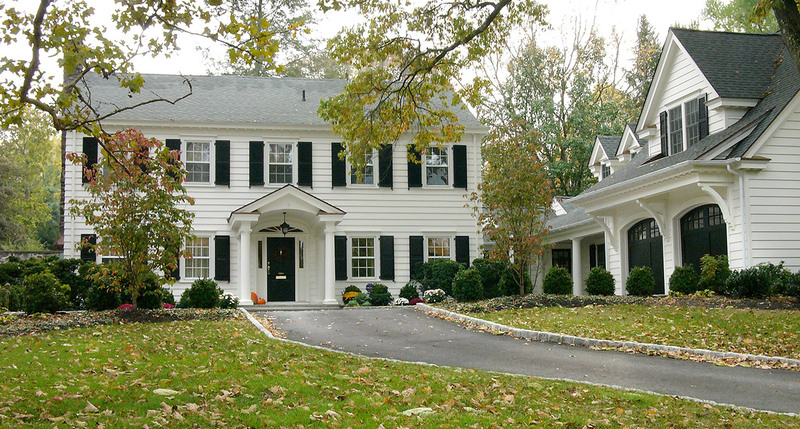 The combination of a white house and black shutters is one that I gravitate to again and again. It's a look that is welcoming and timeless, not to mention it reminds me of one of my all-time favourite movies. No wonder then that I want to incorporate some of these elements into our current curb appeal project. Time to tone down the blue and bring in some white. I know - some of you love the blue - but for me it's just feeling dated and the colour looks a bit washed out. With a few simple changes, our exterior will be looking much more crisp, fresh, and modern. The biggest impact will be had by changing out the garage door. The current door is over 20 years old and certainly acts its age. 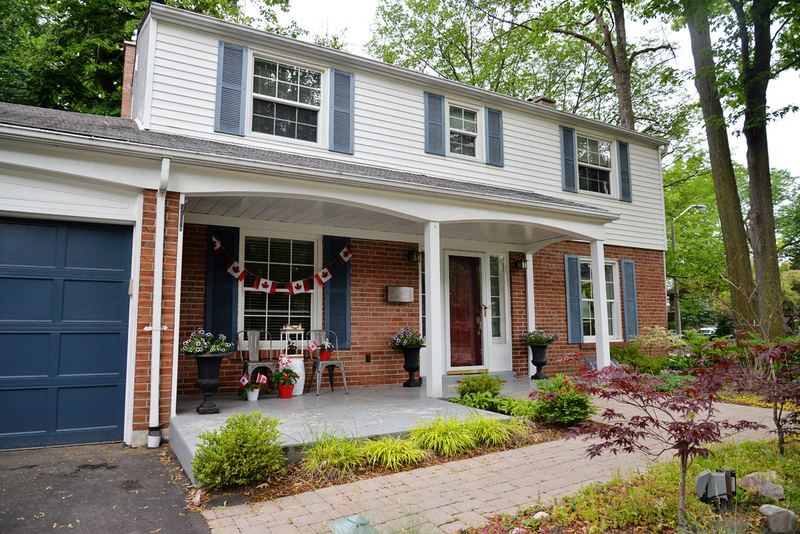 Its noisy and drafty and doesn't do much to add to the exterior charm of our home, so you can imagine how thrilled I was to be working with Garaga to give our garage an update. 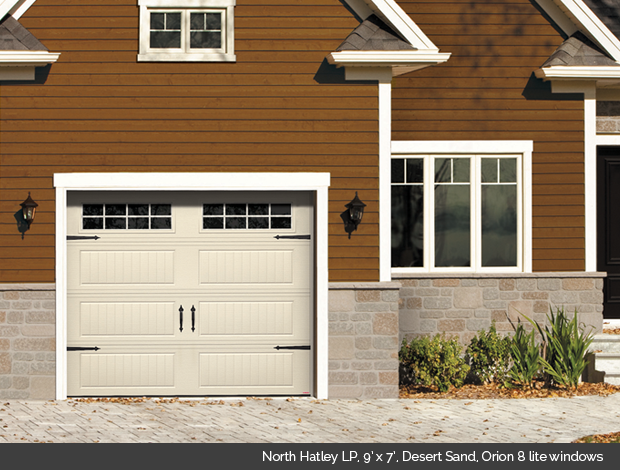 I'll admit, before I looked into Garaga's products "garage doors" to me were all about good looks. Gimme all the carriage house style doors! 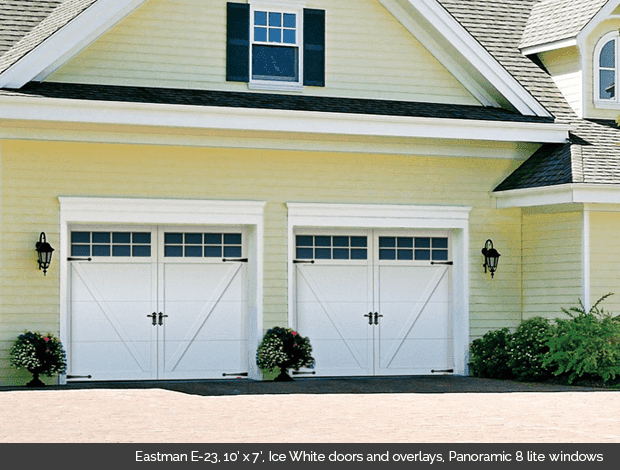 I initially fell in love with Garaga's Eastman E-23 doors. The diagonal overlay and decorative black hinges were stylish and classic. I also liked how the divided lites would work well with the six over six windows on our front facade. But there were other styles to consider too, like the North Hatley. This style was a bit more angular and detailed. The beadboard texture on the panels was attractive and added interest, which was great because we decided the garage door colour would be white and we didn't want it to completely disappear against the house. Diana from The Garage Door Depot came over to our house and walked us through the various Garaga door options. I learned that beyond good looks, its important to consider the R-value (the bigger, the better) and weatherproofing properties of your garage door. Considering how we use our garage - it houses our car, is used for storage, and is a year-round workshop for Sean - we knew that we wanted a door that was not only attractive, but well insulated and weather tight. Here's more about the technical properties of Garaga doors and what goes into their products. Selecting products and finishes for your home can be daunting, but Garaga's garage door selection process was the easiest I've ever encountered. 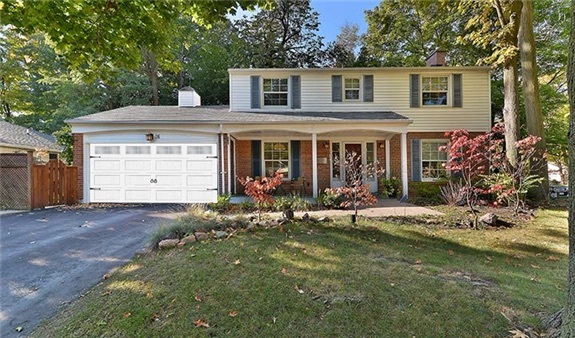 Diana was not only able to provide me three quotes in real-time for different doors we were considering, but through Garaga's online Design Centre, I was quickly able to see exactly how the doors would look on my home. Have a look! We decided on the Standard + North Hatley LP. It provides great insulation (R-16), and the 8-lite clear windows and hinge details really add classic style to our exterior. Installation happens next week and I can't wait to show you the change. We'll be one step closer to a revived and fresh exterior soon! Disclosure: This post was sponsored by Garaga. All opinions and thoughts are my own.